The National Debt of the United States is $22T and climbing. 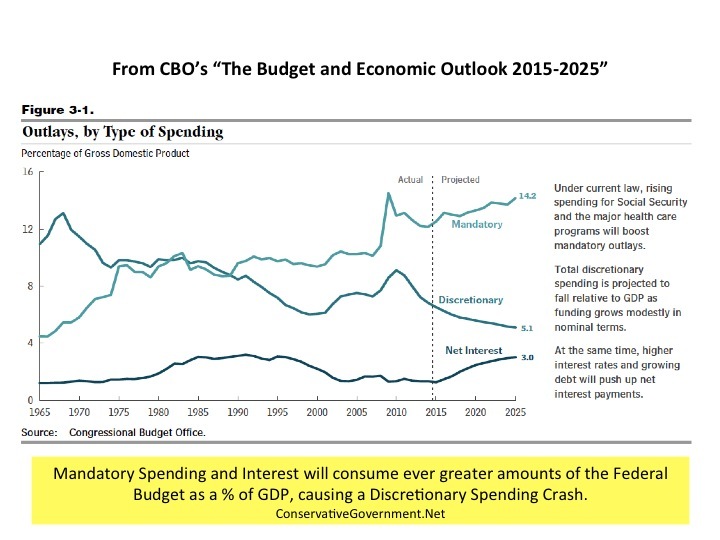 CBO and OMB long term projections show that our debt will continue growing unabated for as long as the government can project it. 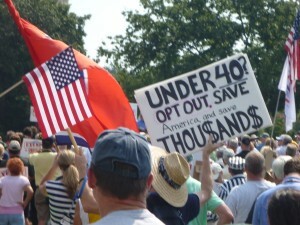 This future is unsustainable, and America must chart a course to a balanced budget before time runs out. CRAMNIBUS II – How Did It Happen Again? For the second year in a row, the American people got stuck with a massive CRAMNIBUS Spending Bill to fund the Federal Government through another year. Spending more today, in exchange for more debt and interest costs later. The GOP bears full responsibility for this one, as they controlled both houses of the Congress for the entire year. Sen Mitch McConnell campaigned in 2013 on restoring regular order. Republicans across the country fought tooth and nail working to return the Senate to the GOP, under the expectation that late night release; massive spending, surprise bills would be a thing of the past. So how did this happen again? The answer lies in the “CRAMNIBUS II” itself. The bill nearly quadruples the number of H-2B visa workers admitted to the U.S. next year to about 250,000. Big money GOP donors and the Chamber of Commerce wanted immigration reform. McConnell and Behner knew that the American People were adamantly opposed increasing immigration. The only way to secure the visa increase was to bury it in a 2000+ page last minute bill. There was time to avoid this, but McConnell and Behner intentionally ran out the clock. They let the legislative calendar slip, and kicked the can with a two month Continuing Resolution which funded the government through 11 Dec, the scheduled final day before the Senate went on recess. All was in place. The OMNIBUS itself wasnt released until the 11th hour, and hid the visa Trojan horse within 2000+ pages. The leadership created the crisis, and the American workers will pay the price. Shame on McConnell, and shame on Paul Ryan for his complicity in the second CRAMNIBUS in as many years. The House Budget Committee released its fiscal year 2016 blueprint, A Balanced Budget for a Stronger America for returning to a balanced federal budget within 10 years. The House annually proposes balancing the budget and this year is no different. What is different, however, is that Republicans now also run the Senate. The evidence clearly shows that the United States is headed for a fiscal disaster if we don’t balance our budget. So how does the House budget proposal plan to accomplish this? It claims to tackle big challenges while restoring accountability. It balances the federal budget in less than 10 years by reducing $5.5 trillion in spending versus Pres. Obama’s FY 16 budget proposal. It would also stave off a severe fiscal crisis that would certainly hit in the future while reforming vital safety net programs. 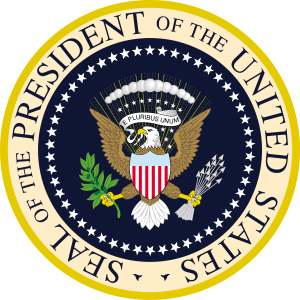 It claims to provide for the defense of our nation fulfilling the first most critical responsibility of our government. It claims to build a foundation for an economy that rewards hard work ingenuity and entrepreneurship while respecting and restoring the principle of federalism. It also aims to reform the Congressional budgetary process, which is designed to reward spending more instead of spending wisely. It recognizes that interest payments on the current path will swamp other spending priorities in the budget if they are not dealt with. It aims to cut out inefficiencies while keeping interest payments from drowning out key priorities. Obama has presided over nearly $2,000,000,000,000 in tax increases in the past six years. The House plan intends to fix the tax code so it is simplified (currently costing America $160 billion annually to comply) and fair for families and businesses. It means to streamline or repeal inefficient, ineffective or counterproductive regulations pouring from agencies like the Environmental Protection Agency and the National Labor Relations Board. It looks to expand US domestic energy production while stopping wasteful government spending on programs that fail to deliver, like Solyndra, while also addressing some of the worst cases of corporate welfare. Across the board the proposal looks to reduce or eliminate duplication among federal programs. Few Americans know about the most recent federal agency created in 2010 called the Corporation for Travel Promotion. One thing the United States does not need is to advertise how wonderful a country we are in order to get people to come here. Our problem involves slowing down the title wave of people every year who attempt to get into America. It proposes complete repeal of Obamacare while saving, strengthening and securing Medicare, Medicaid and Social Security essential entitlement programs that on their current path will bust the budget and the American taxpayers. In summary, the House plan is meant to balance the budget, reform the tax code, strengthen defense while reforming and saving the major entitlement programs which constitute the Giants in the federal budget. Failure to address these programs now as wisely suggested in the proposal, will force draconian federal budget cuts down the road and further rob our children of their financial futures and God given freedoms. Considering the admirable goals of the House Budget Committee proposal, it only makes sense that Democrat politicians hate it. Their alternative, like socialism in general, is completely unaffordable! 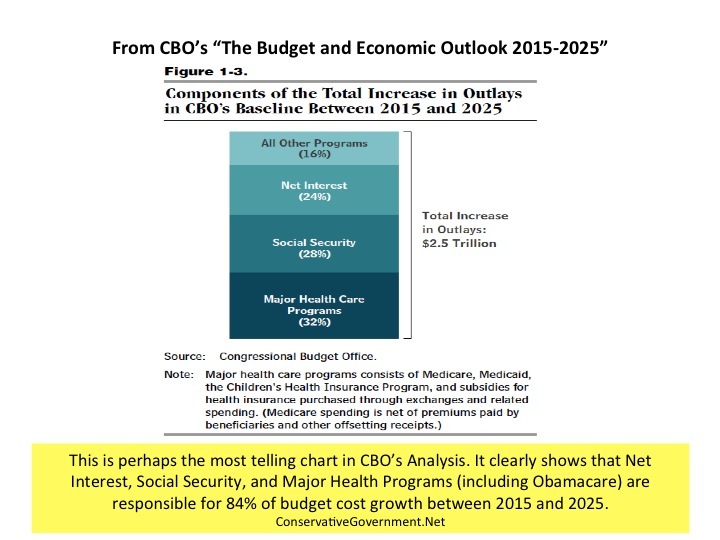 The following quotes were taken from the CBO’s Jan 15 report, found here. They continue warning America that if our country doesn’t change the fiscal course that it’s on under excessive tax and spend policies, our country is headed for a disaster. We need to stand up, get vocal, vote out the spenders and force our elected officials to balance the federal budget, before the mounting $ trillions that we owe dooms us! Beyond 2017, real (inflation-adjusted) gross domestic product (GDP) will grow at a rate that is notably less than the average growth during the 1980s and 1990s. Cumulative deficits over the 2016–2025 period are projected to total $7.6 trillion. 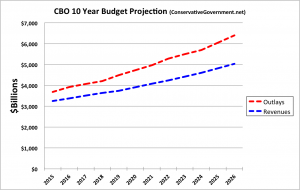 CBO projected under current law, debt would exceed 100 percent of GDP 25 years from now and would continue on an upward trajectory thereafter;a trend that could not be sustained. 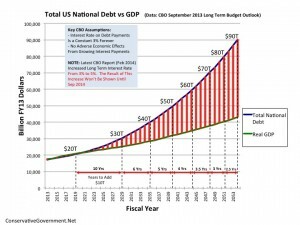 Such large and growing federal debt would have serious negative consequences, and are unsistainable. Interest rates on Treasury securities, which have been exceptionally low since the recession, will rise considerably in the next few years. Net interest payments increase from $227 billion, or 1.3 percent of GDP, in 2015 to $827 billion, or 3.0 percent of GDP, in 2025. Gross federal debt is projected to rise by $9.5 trillion over that period and to total $27.3 trillion at the end of 2025. The Long-Term Budget Outlook: Beyond the coming decade, the fiscal outlook is significantly more worrisome,public debt would exceed 100% of GDP by 2039. 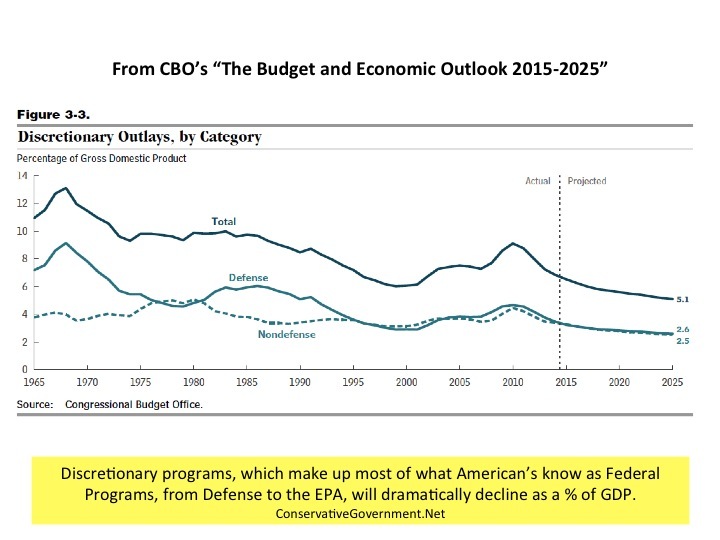 The following 3 charts were pulled from CBO’s supporting analysis, and show the Federal Budget’s, and America’s future if significant changes aren’t made to control mandatory spending. President Obama unveiled his 2016 BCA busting budget on Monday at the DHS Headquarters. The President extolled the virtues of his budget cutting, stating that he reduced annual deficits by two thirds since coming into office. Let’s examine that statement. President Obama’s starting point was the largest deficit in American, and probably world, history, at over $1.4T in 2009. In absolute terms, he signed the largest tax increase in American History, so he did raise more money by taking it from the American people. Despite the ever-growing threats to our national security, he did substantially cut the US Military. He also increased spending in many social programs and wealth redistribution programs, which more than compensated for defense cuts. The Budget Control Act of 2011 capped his spending increases. The BCA was the real control on spending, and it was thrust upon him when the American voters gave the GOP control of the House. Now let’s take a look at where the budget increased the most. The Top 10 Largest Increases in FY16 (based upon dollars) – Where possible, color-coding has remained consistent with analysis of Social Programs/Wealth Redistribution. – The 2015-2016 Delta column is a pure dollar comparison between FY15 and FY16. The % Delta column is added to show the magnitude of the increase compared to total program costs. Similar data is also presented for these same Top Ten comparing growth from 2007 (President Bush’s last pure budget) in purple to President Obama’s 2016 budget. What’s startling is that the combined growth of the top 5 programs in Chart 1 equals nearly $1.1T. That amount of annual growth alone is equal to the entire discretionary portion of the Federal Budget, including the Department of Defense. Not surprisingly, the largest FY15 to FY16 increases are, interest and social programs. The defense increase follows two years of significant budget cuts despite an ever more dangerous world. Also, Immigration Reform (highlighted in Red), totaling $8B, never existed before in the Federal Budget. 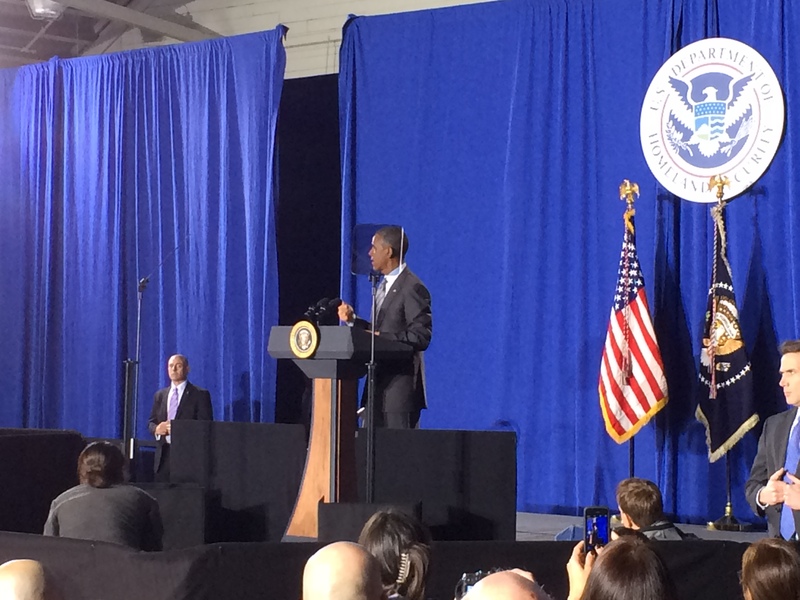 The President is adding a brand new subfunction, despite the uproar and accusations of illegality over his executive amnesty. Without question it’s an in your face message to the new GOP majority, and unlikely to survive congressional budget hearings. What are The Federal Budget Giants? 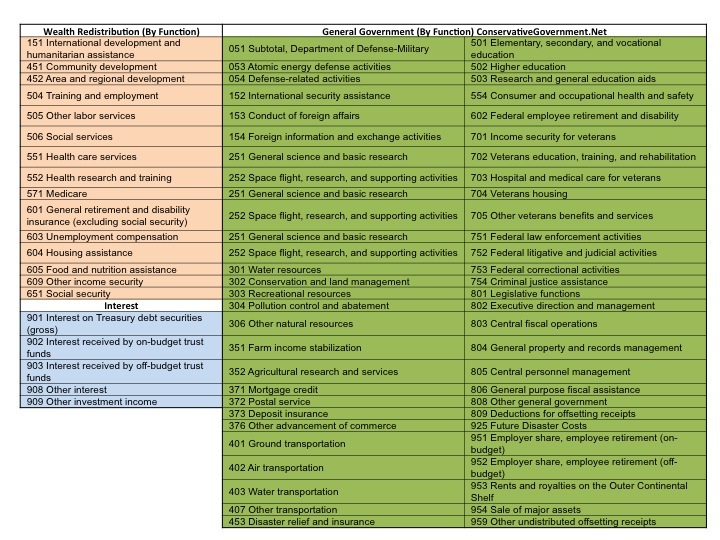 What are the giant programs in the US Federal Budget? 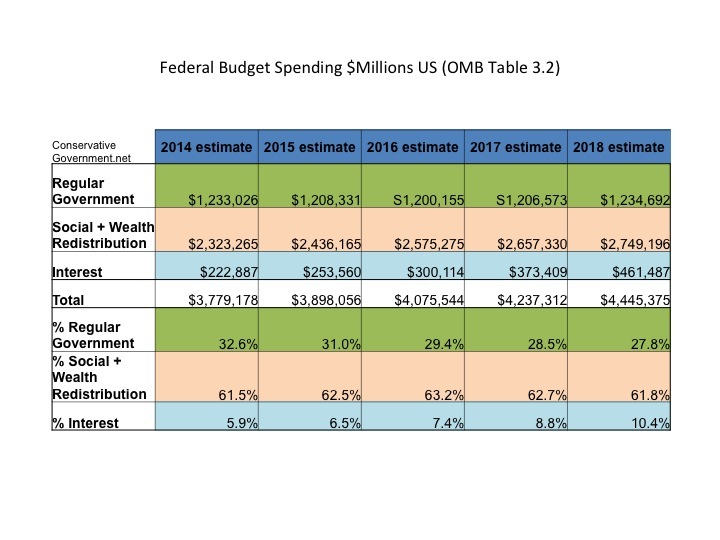 As promised in my last Blog, I break down OMB’s budget Functions within the Human Resources Superfunction in this Blog. The largest Function is clearly Social Security, exceeding $1T/year starting in 2017. By Comparison, the National Defense Superfunction is only $578B in 2017. 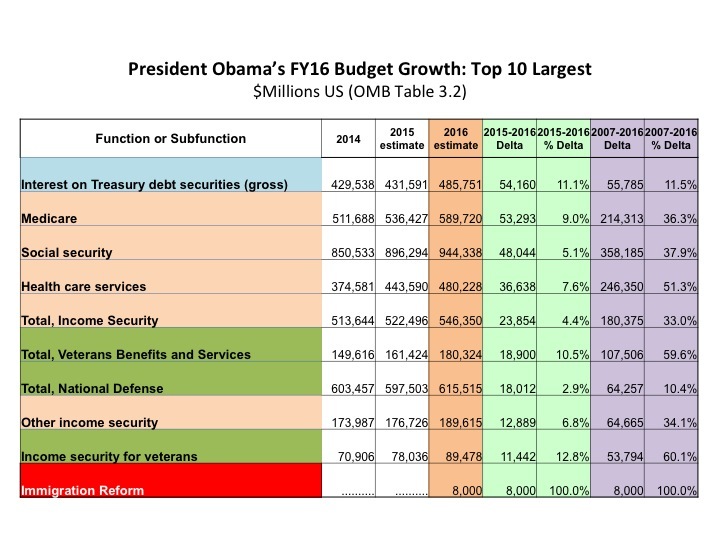 US Federal Budget – Social Security dwarfs the rest of the Functions including National Defense! Note the distinct drop in spending in some of the Functions in (Income Security, Health, Education, Training, Employment and Social Services) after 2010. These Functions are within the Discretionary portions of the Federal Budget and were curtailed as a result of the GOP taking the House in the 2010 midterms. 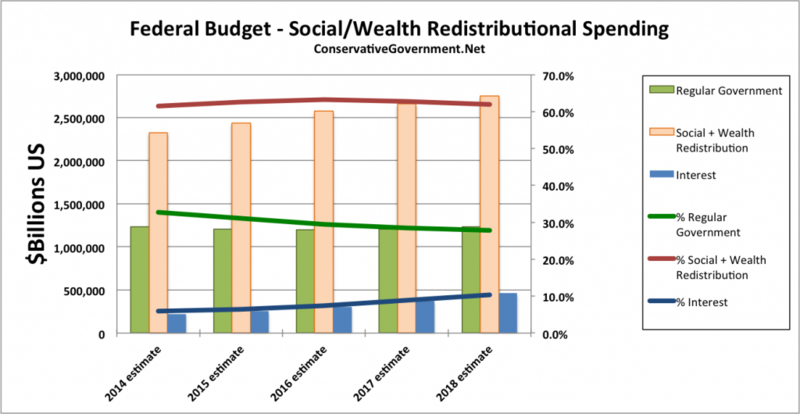 Social Security is within the Non-Discretionary part of the budget and was untouched. Also note that the Health Function rapidly grew again despite initial reductions. This was due to paying for Obamacare, which was wrongly named the “Affordable Care Act”. Do you ever wonder where your tax dollars go? The Office of Manpower and Budget (OMB) uses accounting buckets to aggregate programs and spending. It calls large program groupings “Superfunctions”. 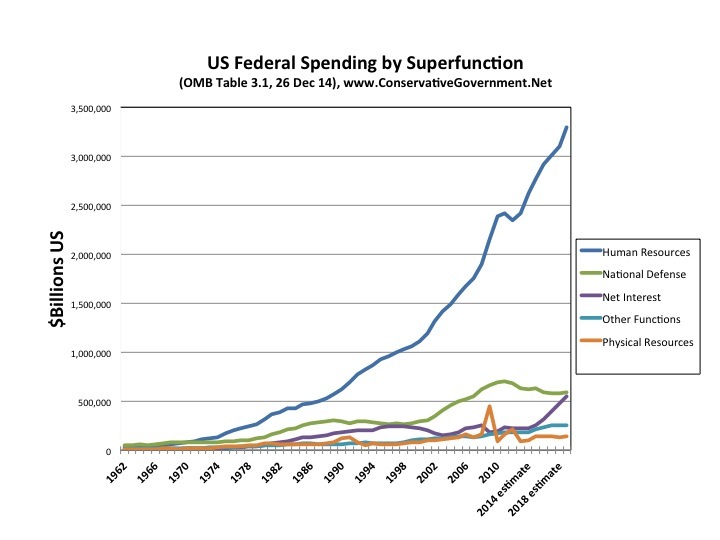 The below chart clearly exposes that Superfunction monster. The blue line is the Superfunction named “Human Resources”, and it’s growing at an frightening rate. 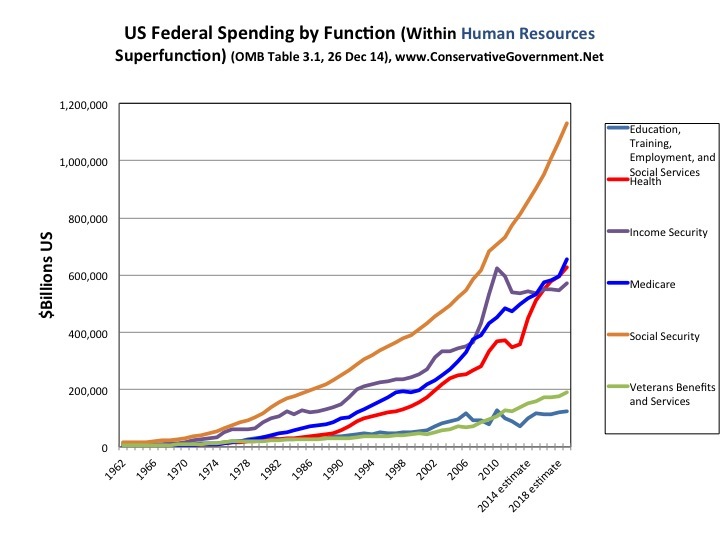 US Federal Budget – Human Resources dwarfs the rest of the budget, including National Defense! My next Blog will break out those Functions in another chart, to show the magnitude of each Function. If we are going to solve our unsustainable spending, we all need to understand where the money is going. 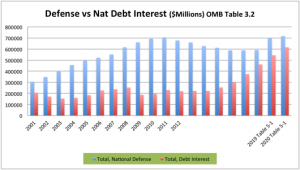 Note: The purple line, which is the Superfunction “Interest” (on the National Debt), is growing at nearly the same unsustainable rate as Human Resources.